Gladys L. (Parella) Husted, 74, of Forest Hills, passed peacefully Thurs., Oct. 13, 2016, in her daughter's arms, at her daughter's home in Murrysville. Born Oct. 26, 1941, in Pittsburgh, Gladys was the daughter of the late Tony and Mabel (Meyers) Parella. Gladys joined the Duquesne University School of Nursing faculty in 1968, and continued to work in some capacity up until 2015. She taught students in the classroom, clinical arena, and online. She chaired over 20 student dissertation committees. Gladys achieved numerous honors including: Bioethical Scholar, Cameos of Caring Nurse Educator Award, Distinguished Lecturer, School of Nursing Distinguished Professor in Perpetuity, Duquesne University Faculty Award for Excellence in Teaching, and the Duquesne University School of Nursing Recognition Award for Excellence. Her publications and scholarly works were predominantly in the area of bioethics. She co-authored the book, Bioethical Decision Making in Nursing, in which she introduces her bioethical theory, Symphonology, the study of agreements. 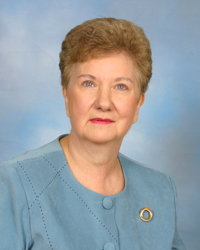 Gladys held the rank of Professor Emeritus since 2007, and was an advocate for education for nurses. She touched the lives of countless students. Gladys is survived by her husband of 42 years, James Husted; beloved daughter Tabitha (Husted) Riggio and husband Rich; grandchildren Melanie and Allena Riggio; and stepchildren Keri (Husted) Kalwaytis and Lisa (Husted) Dreyer and their families. Gladys had many happy memories of friends and family at her summer home in Ligonier. In her youth, she enjoyed dancing, and even took a tap class a few years ago. She enjoyed murder mystery novels and television programs, such as the old Perry Mason and the newer Scorpion. Her favorite author was John Dickson Carr. She could not get enough of judge shows, such as Judge Judy. Gladys was an excellent cook and a connoisseur of red wine. Vacations were mostly spent in Atlantic City, NJ; Chautauqua, NY and Toronto, Canada; and the NAPA Valley of California, in order from youth to adulthood. Gladys will be greatly missed by family and many friends, who have provided amazing love and support throughout her ten-month battle with cancer. But what stands above all else in Gladys's life was her incredible relationship with and love for her daughter, Tabitha. Gladys will be remembered most of all as a cherished mother and grandmother.